Low-intensity eccentric contractions with a load corresponding to 10% of maximal voluntary isometric contraction strength (10% EC) attenuate muscle damage in a subsequent bout of higher-intensity eccentric contractions performed within 2 weeks for the elbow flexors, knee flexors and knee extensors. However, it is not known whether this strategy could be applied to other muscles. 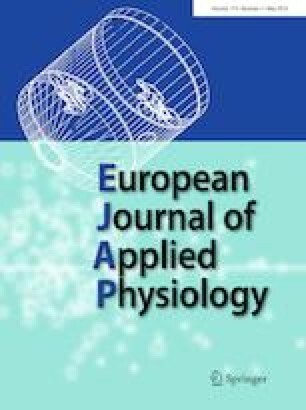 This study investigated whether 10% EC would confer damage protective effect on high-intensity eccentric contractions (80% EC) for nine different muscle groups. Untrained young men were placed to an experimental or a control group (n = 12/group). Experimental group performed 50 eccentric contractions with a load corresponding to 10% EC at 2 days prior to 50 eccentric contractions with 80% EC for the elbow flexors and extensors, pectoralis, knee flexors and extensors, plantar flexors, latissimus, abdominis and erector spinae. Control group performed 80% EC without 10% EC. Changes in maximal voluntary isometric contraction strength (MVC) and muscle soreness, plasma creatine kinase (CK) activity and myoglobin concentration after 80% EC were compared between groups by a mixed-factor ANOVA. MVC recovered faster (e.g., 6–31% greater MVC at 5 days post-exercise), and peak muscle soreness was 36–54% lower for Experimental than Control group for the nine muscles (P < 0.05). Increases in plasma CK activity and myoglobin concentration were smaller for Experimental (e.g., peak CK: 2763 ± 3459 IU/L) than Control group (120,360 ± 50,158 IU/L). These results showed that 10% EC was effective for attenuating the magnitude of muscle damage after 80% EC for all muscles, although the magnitude of the protective effect differed among the muscles. The authors thank Mr. Yu-Chieh Chou for his assistance in the data collection. All authors (MJH, KN, HSW, KWT, TYC, HLC, and TCC) contributed to the data analysis and interpretation of the data, drafting, and revising the manuscript, and approved the final version of the manuscript. The original study design was made by TCC and KN, and discussed with the other authors, and MJH, TCC and HLC performed data collection. This work was financially supported by the Ministry of Science and Technology (MOST 105-2628-H-415-036-MY3) and the Higher Education Sprout Project by the Ministry of Education (MOE) in Taiwan. All procedures performed in the present study were in accordance with the ethical standards of the institutional research committee and with the 1964 Helsinki declaration. A written informed consent was obtained from each participant participated in the study.